If you’ve been reading my blog for a while, you’ve probably noticed that I shop at Target a lot. I really love their clothes, they are well-made, affordable and always on-trend. It’s even better when you can find a super cute piece on the markdown rack! My mom found this pink and orange belted sheath and told me I had to buy it because it was only $14.98. I’m so glad I did because it’s just so cute. Can you believe this was $14.98?! The dress is ponte knit, so it’s really comfortable and doesn’t wrinkle easily. The backside has an exposed zipper, which is a detail I really love. Although the weather here in San Antonio has been fairly warm (75 degrees F! 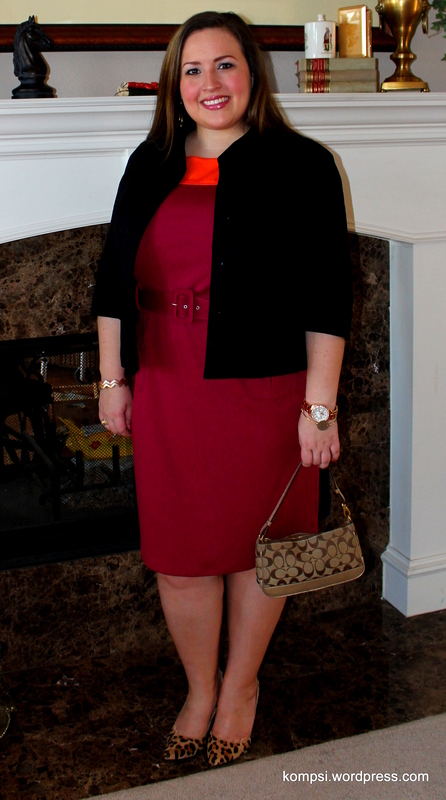 ), I paired a jacket with the sleeveless sheath because it is still February and technically winter! Lastly, the leopard ties in the colors from my handbag and my jacket because leopard is a neutral! Love the bit of color block on the top of the dress! Fabulous!